Last November, an exhibition called “The Tempe Sound” opened at Tempe History Museum. The show (which runs through October 2015) features an array of items related to the Tempe and metro Phoenix music scenes of the late ’80s and early ’90s. There are early concert posters for The Meat Puppets, the sound board from defunct venue Long Wong’s, stage outfits from the Phunk Junkeez and St. Madness, a skateboard deck from JFA, and a plethora of paraphernalia from other Arizona artists including The Refreshments, The Pistoleros and Flathead. But for many, the main draw of the exhibition is a display of items related to the late Doug Hopkins, founder and guitarist of the Gin Blossoms. Hopkins penned the Blossoms’ best-known hits, including “Hey Jealousy” and “Found Out About You,” but his struggles with personal demons led to his dismissal from the band and suicide in 1993. 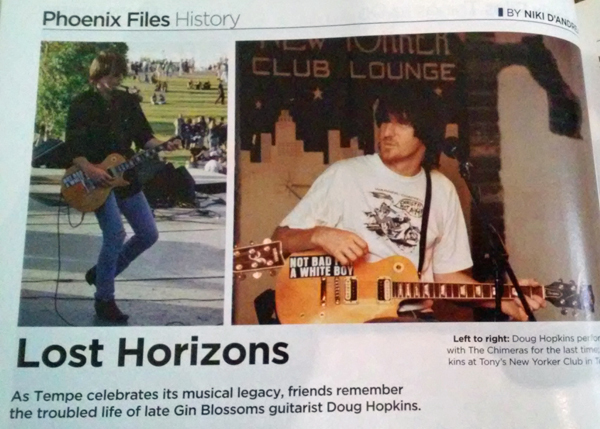 For the November 2014 issue of PHOENIX magazine, I wrote a story about Hopkins’ life and music, named after the title of my favorite Gin Blossoms song, “Lost Horizons.” For this story, I had the honor of speaking with many of Hopkins’ friends and former band mates, including author Laurie Notaro, Arizona bluesman Hans Olson, and Gin Blossoms singer Robin Wilson. I was impressed by the talent and personality and intelligence of Hopkins as it was relayed to me, and perplexed at his ultimately tragic (and some say inevitable) end. After the story was published, I had the opportunity to speak with “Here and Now” host Steve Goldstein about Hopkins on 91.5 KJZZ FM. Here is a link to the segment on Hopkins.